You can live well in Thailand for less than $2,500 per month. Where you decide to settle will have a large impact on your monthly expenses—a view of rice paddies from your balcony will be less expensive than looking out over the waves crashing onto a sandy beach. And a modern apartment in one of Bangkok’s many bustling neighbourhoods is not going to come dirt cheap. Here’s a sample monthly budget for two people living comfortably in Chiang Mai. This gives a monthly total of $2,470 to $3,100, which would be a realistic budget for a retired couple living in various parts of the country and dining on a mixture of local and international foods. When you realise that Chiang Mai has a population of several hundred thousand and comes with all the amenities of a large, modern city, you can appreciate just how low some of these costs are. It is certainly possible to live on less, especially in the smaller towns and more rural areas. You can still find studio and one-bedroom apartments available for under $400 per month. Buying most of your groceries at the local markets as opposed to the large international chains will save you a bundle. Finally, because of the relatively inexpensive cost of healthcare, many expats rely on savings for medical emergencies in place of purchasing health insurance with high monthly premiums. The landscape in Hang Dong, the northern Thai district I call home, is a random mix of rural and urban Thailand. Rural villages with windy, country roads are dotted with Lanna-style temples amidst sprawling fields and tropical shrubbery. The urban roads are lined with low-rise shop-houses and local businesses selling everything from car parts to cosmetics. Residential areas range from pockets of small villages to grander, gated communities. From the balcony of my 14th-floor home I can gaze upon a fertile landscape. 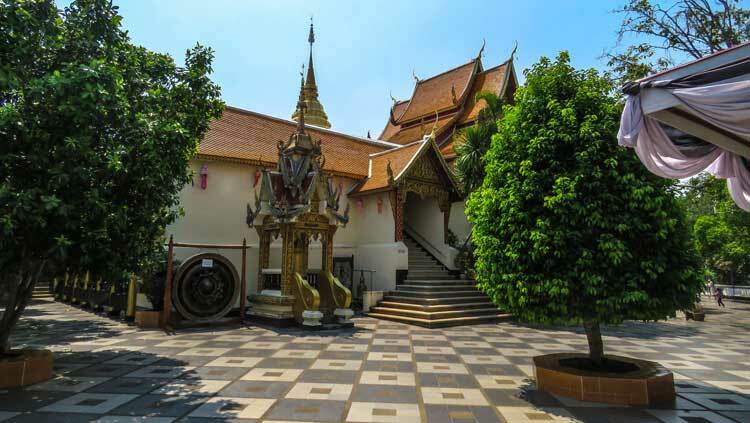 The northern Thai city of Chiang Mai sits surrounded by views of lush, forested hills. The icing on the cake is the golden Buddhist temple on Doi Suthep mountain. During the day, it sparkles in the sunshine and at night local monks illuminate it, making it shine gold in a pitch black sky. The effect is stunning—the temple looks as if it’s floating in the darkness by magic. The last couple of years have been the most adventuresome of my life. Inspired by my wife, Bonnie, we’ve been pursuing our dream of seeing the world for some time now. But a number of months ago, we decided it would be nice to settle down for a while…and found the perfect place in Chiang Mai, Thailand. Famous for dense mangrove forests, sheer limestone cliffs and hundreds of amazing islands that appear as if dropped into the ocean from somewhere else, Krabi, on the southern part of Thailand’s west coast across from the island of Phuket, is where many movies were filmed—think James Bond’s, Man with the Golden Gun and Leonardo DiCaprio’s, The Beach. In 2013 Kim Shield’s brother invited her and her husband, Michael, to Krabi to look at the house he was building there. And it was while exploring the area with their family, they noticed how much the area had to offer. Many people think of Chiang Rai in northern Thailand as Chiang Mai’s little brother but most of those who live there take that as a compliment. True, there isn’t the nightlife that you find in its big brother a three-hour drive south but that’s more than made up for by the easy pace of life, deliciously spicy Lana food and some weirdly wonderful local attractions.